Season Launch tickets selling fast! 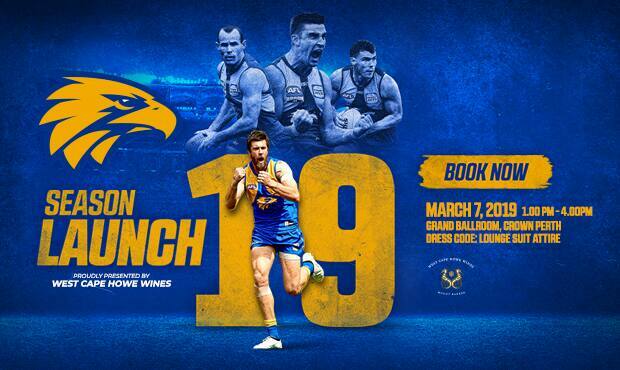 The West Coast Eagles will begin its countdown to bouncedown on Thursday, March 7 at the club’s official 2019 Season Launch event. Don’t miss this opportunity to enjoy a three course luncheon and premium entertainment in the company of the reigning premiers. This year’s Season Launch, to be held at Crown Perth’s Grand Ballroom, will also feature the unveiling of the 2019 squad who will drive our premiership defence, an address from club chairman Russell Gibbs and the introduction of our new No.1 ticketholder. Senior coach Adam Simpson and premiership captain Shannon Hurn will also reflect on the success of season 2018 and provide some not-to-be-missed insights about the preparations for the upcoming home-and-away campaign. Tickets are selling fast, so CLICK HERE to secure your spot at what promises to be one of the club’s most memorable events in recent history. The West Coast Eagles 2019 Season Launch is proudly presented by West Cape Howe Wines.